Police are looking to identify and locate the suspect who robbed Little Caesars in Hunting Park. Police are seeking the public's help in finding a suspect wanted for robbery in Hunting Park. 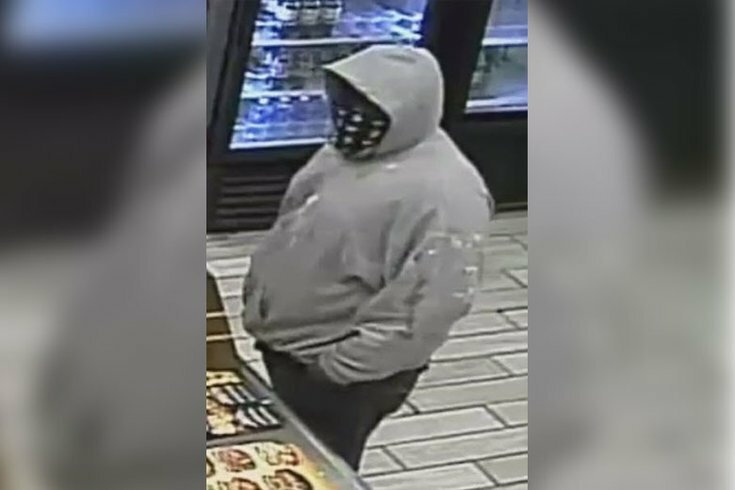 In surveillance video released by police Wednesday, an unknown male can be seen entering the Little Caesars at 4322 North Broad Street on Friday at 9:20 p.m. The suspect, who is armed with a handgun by his side, approaches an 18-year-old female employee and demands money. When the employee takes several bills out of the register, the suspect grabs the money from her hand and flees the restaurant. Police say he was last seen heading toward Carlisle Street. No injuries were reported during the incident. Police describe the suspect as a black male, around 5 feet 7 inches tall, with a heavy build. He was seen wearing a gray hooded sweatshirt with white paint spots, dark-colored pants with white paint spots, a black/white bandana covering the lower portion of his face and armed with a handgun. Anyone with information is encouraged to contact police at (215) 686-TIPS (8477) or text a tip to PPD TIP (773847).